Do you suffer from stress-related neck pain that originates at the base of the skull and crawl up into your head? Or chronic neck pain that doesn’t respond to medication at times? Perhaps an acute crick in the neck upon waking in the morning? 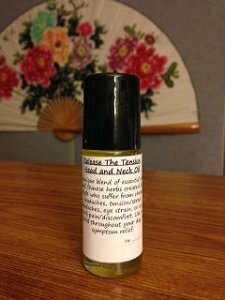 The Nourish Neck Tincture is the safe, topical answer for your neck and head pain. 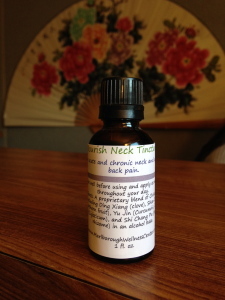 Created by an herbalist who used to suffer from neck pain and migraines, it is safe to use this tincture throughout the day and can easily be applied directly to your painful areas. Shake well before use and consult an physician if you are pregnant. Ingredients: A proprietary blend of Chinese herbs including Ding Xiang (clove), Shan Zha (Hawthorn fruit), Yu Jin (Curcumin), Chuan Xiong (Ligisticum), and Shi Chang Pu (sweetflag rhizome) in an alcohol base.